Just because an animal possesses structures that reflect polarized light doesn’t mean that these structures are for polarization signalling. This work presents the idea that evolution can select light polarizing structures for other reasons, like to simply improve the reflectivity of a material. Despite the awesome diversity of photoreceptors in adult mantis shrimp, stomatopod larvae are understood to only possess one class of photoreceptor cell in their retina. This study measured the light absorbed by photoreceptors in a diverse sample of stomatopod larval species and found that there may be an unexpected level of complexity among species and across the development of a single animal. Stomatopod larvae go through the most bizarre eye development – a double retina phase! This is the period when the adult eye structures take over and push out the larval ones. This work is the first to investigate what is going on with the eye physiology during this unusual transition. Stomatopod larvae possess dazzling, glitter-like structures in their eyes. 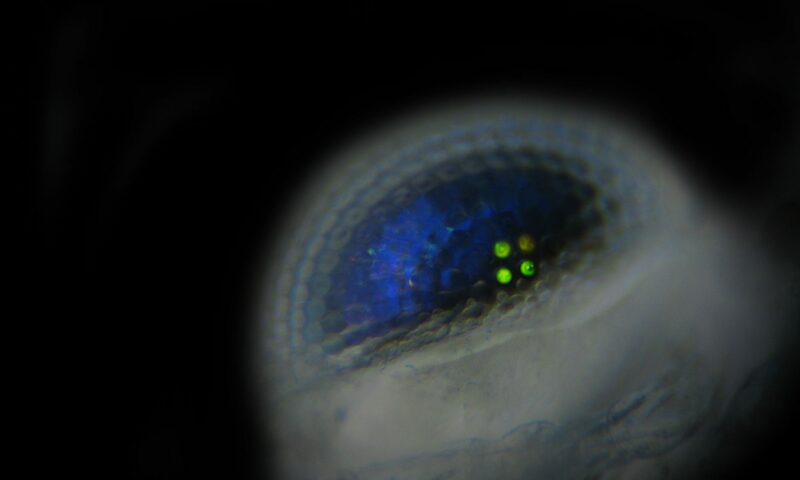 In this publication I provide evidence that this green, blue, or gold eyeshine may serve as a camouflage in the open ocean where larvae live. My image was also selected for the cover of this issue of the journal. Almost all stomatopod species descriptions are based on the morphology of the adult phase. Consequently its really difficult to ID larvae caught in the field. One technique I developed uses DNA barcodes to identify animals after I run an experiment. This paper is the first to outline this method as well as provides a morphological key so others can more easily identify and work with these species. Male freshwater darter fishes use conspicuous color signals to successfully secure mates. This study examines the spectral characteristics of these colors and represents my entry into reflectance spectroscopy and study of color in nature. My first publication on the photoreceptor cell types found in Little Brown Bats of North America. During this study I didn’t just characterize the molecular opsins expressed in a bat retina, but I launched myself down a wild and interesting career of visual ecology research. (note: the bat depicted is an Ozark Big Eared Bat. I have yet to be commissioned for a Little Brown Bat illustration).